Warning: Spoilers for "Aquaman" below. "Aquaman" blew past the billion-dollar global box office mark — and any prior notions that the superhero of the seas is a dorky, green tights-wearing fish-whisperer. 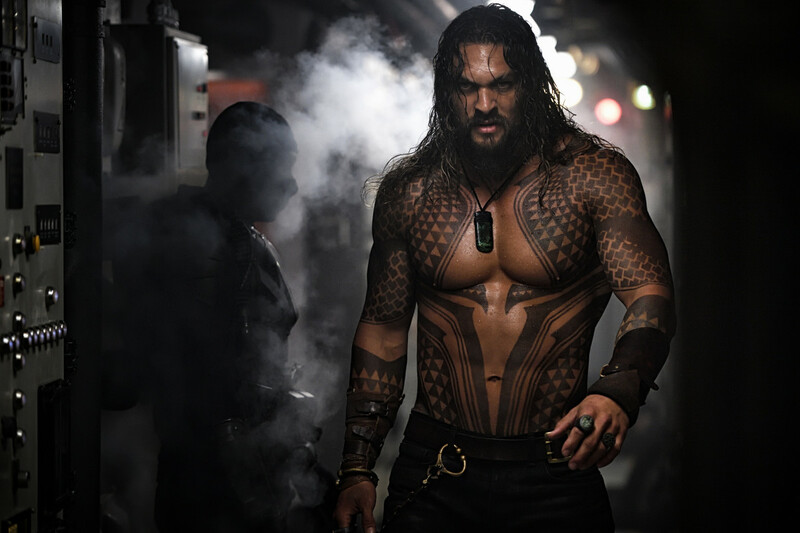 Of course, former Dothraki Jason Momoa&apos;s impressive physique and easy charm as Arthur Curry helps reimagine the previously B-list hero — with a hefty assist from costume designer Kym Barrett, who bestows Aquaman with a stunning new supersuit for his standalone movie. In addition to creating the spectacular, hammered gold-topped and intricately scaled Aqua-suit, the veteran costume designer took on an ambitious role in creating wardrobes for legions of underwater dwellers in Atlantis and beyond, humans from Massachusetts to Sicily and various heroes and villains traversing both land and sea. Even when Momoa is wearing just pants — as he does quite a bit in the film — that required expert design behind-the-scenes, too. The movie itself, directed by Australian James Wan ("Saw," "Insidious"), is also a departure from the usual dark — figuratively and literally — DC universe aesthetic. 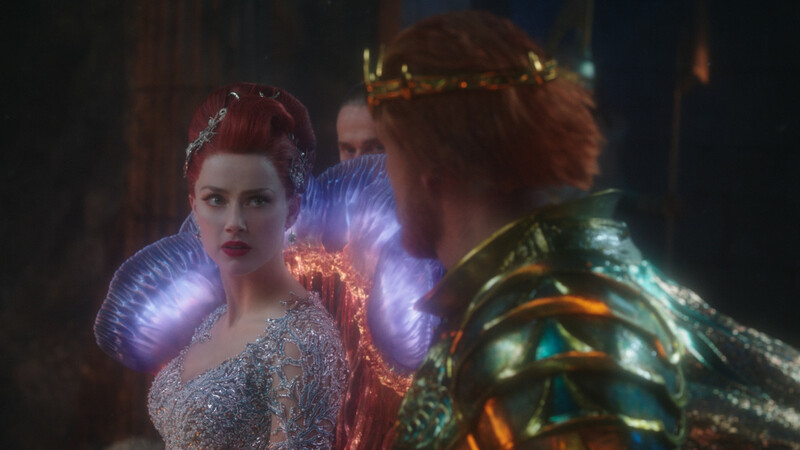 Brilliant light and gorgeous color characterize the underwater scenes, including the extravagant scaled armor looks, which actually do have a slight fashion inspiration — or what Barrett, who just received a Costume Designers Guild Award nomination for the movie, thought the Atlanteans would consider to be fashion. "They can only be influenced by what they see around them," she explains, over the phone. "They see glistening fish scales and beautiful colors from coral and vegetation." She also needed to distill the practicality of living underwater, as the evolved humans would need specialized clothing to keep warm, handle the pressurized depths and help camouflage them amongst the verdant seaweed and vibrantly hued oceanic life. Or, if close to the surface, the glistening, light-reflective aspect of the "porous membranes" in the suits would help them blend into the water and hide from nosy humans looking from the shore. Barrett and Production Designer Bill Brzeski also brainstormed extensively about how the highly advanced Atlanteans would be utilizing the living, breathing resources around them, like the water-holding coral cells. This explains the hexagonal patterns on the scaled armor that Atlanna (Nicole Kidman) and Mera (Amber Heard) wear. To physically build the underwater suits and armor, the veteran costume designer reached into her bag of hi-tech costume tricks. "It&apos;s the most complex process," says Barrett, especially because the suits needed to look as if they were submerged, while the actors were actually filmed wearing harnesses against green screen on dry land. Once the artwork illustration team finalized the patterns and designs, the digital files were sent to Los Angeles-based printer Karen Winn of By Design, who has "perfected" a specialized heat process to create a "rubberized print" onto four-way stretch fabric. Barrett&apos;s team then heat-pressed a "foil-product" onto long sheets of the rubberized texture, which finally arrived with the textile arts department. "Then we hand-painted all of the final layer of wet-look and tint onto the top of that," Barrett explains. "It&apos;s a longish process." Ultimately, the design of Aquaman&apos;s spectacular new suit was born out of both aesthetics and practicality. (Michael Wilkinson designed his previous starter suit and full-torso tattoo design in 2017&apos;s "Justice League.") 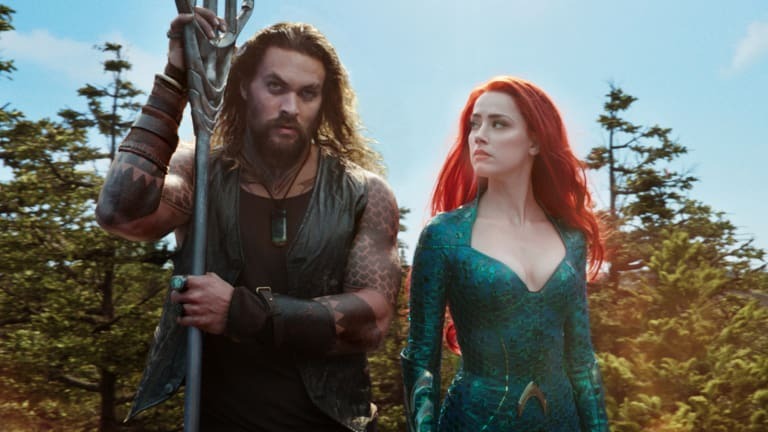 Barrett and director Wan wanted a look that that was both fantastical and believable — not just for the audience, but for the actor portraying Aquaman, too. "We had Jason to use as our body and our character, so I knew that he was never going to wear a leotard-y type deal, even though he needs to be able to do [elaborate stunts]," says Barrett. She expertly designed the muscle-hugging supersuit to allow room for stunt padding and sewed in hidden zippers for the harness hooks, while strategically placing the seams. "I just looked at his body and worked out where the seams would enhance all his attributes," she says. While the dedicated seam-work helped highlight Momoa&apos;s diligent workouts and extraordinary physique, the gilded shawl-collar V-neck on the suit showcased his grooming — more specifically, the pointed shape of his signature facial hair. "I didn&apos;t want the beard and the neck of the suit to join together, so much that he looked like he has this big, thick neck," she says, about her attention to detail. "So I made sure we saw a little bit of flesh, when he moves around." All this attention to detail paid off, although, Momoa did have to make some physical sacrifices to wear his snug new supersuit — but he was team player. "It looks like it&apos;s easy to pee in that, but really it&apos;s not," the actor told Entertainment Weekly in November. “And if you have the poopsies, it is very challenging. You&apos;ve gotta be really good at holding it." 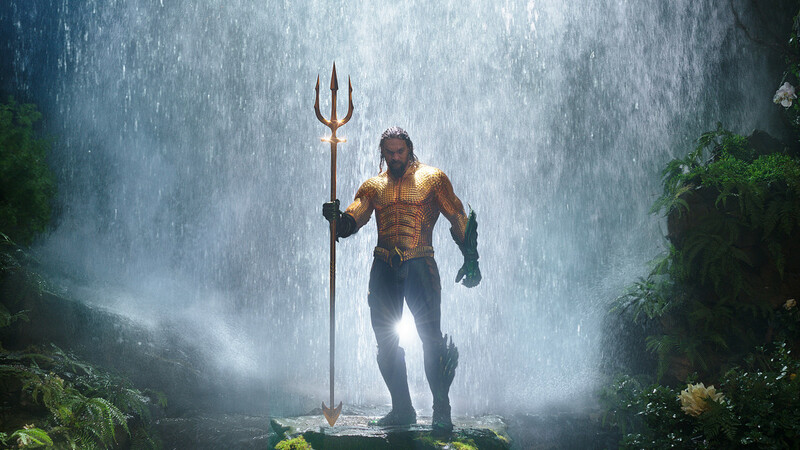 Thankfully for Momoa, Arthur spends most of the time in his rugged street clothes (or just jeans) in and out of the water. 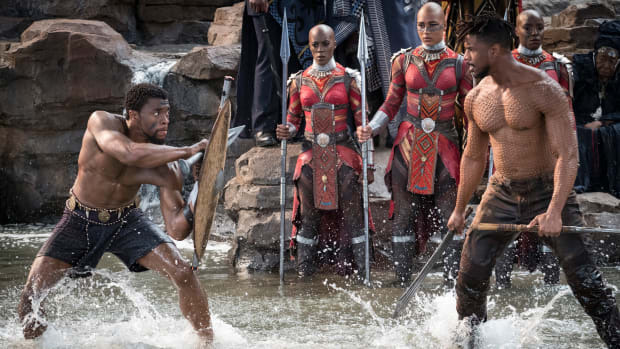 "We were going for a slightly romanticized, real world [look]," explains Barrett, who created a "1930s explorer" vibe for Arthur and Mera&apos;s jaunt to Africa (cue Pitbull) and Sicily. "In the press, people have said things like, it&apos;s got a &apos;Romancing the Stone&apos; vibe or an &apos;Indiana Jones&apos; feeling and that, I agree. That&apos;s on purpose." Momoa himself influenced Arthur&apos;s coastal civilian aesthetic of leather layers, rugged jeans and an impressive array of man jewelry, like battle-ready cuffs that tie forward to his Aqua-suit gauntlets. The actor recommended designers and brands he supported in his own personal life and in past roles to Barrett (and gave them a lovely, heartfelt shout-out on Instagram). "He&apos;s got a real design sense himself and he knows what looks good," says the costume designer, who incorporated many pieces into the costumes. "He&apos;s into clothes and shoes and things like that. So it doesn&apos;t make any sense to not embrace that." She says Momoa would even venture into the office during lunch breaks to discuss accessories options, down to the belt buckles. Arthur&apos;s chunky jewelry comes from King Baby Studio, his custom boots from Wesco, hats from Gunner Foxx and bespoke jeans from Schaeffers Garment Hotel. (Pro-tip from Momoa: "Ask for Robert"). "Because of Jason&apos;s, you know, dimensions, he has to have jeans custom-made," says Barrett. Los Angeles-based Made Worn designed the prototype of Arthur&apos;s leather vest, which Barrett&apos;s team then recreated for upwards of 400 multiples. While Arthur&apos;s on-land wardrobe gives the character authentic, real-world, tough-guy swagger, the costume designer does emphasize that "the choices were more an artistic decision than a fashion decision. It was a story-based decision." Of course, Barrett does have a penchant for turning her story-based costume decisions into bonafide fashion. 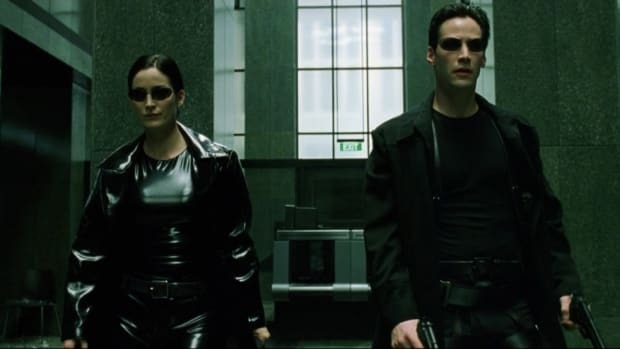 See: the &apos;90s-meets- Elizabethan romantic slip dresses from Baz Luhrman&apos;s "Romeo + Juliet" and longline leather jackets in "The Matrix" trilogy. 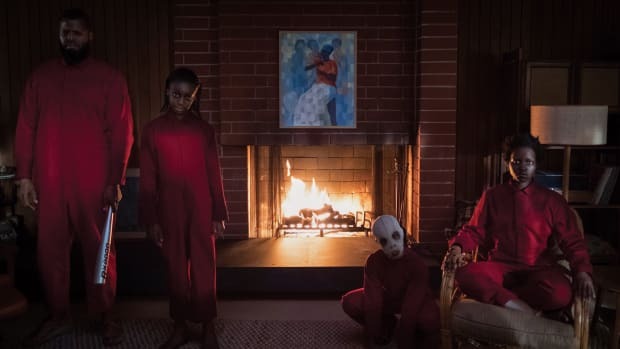 (Plus, her coordinated — and terror-inducing — blood-red outfits for the family may just become a thing when Jordan Peele&apos;s upcoming horror flick "Us" comes out in March.) Considering that Heard already made, erm, waves, on the red carpet in aquatic-referencing Valentino, underwater-influenced fashion could be all the rage for fall 2019. "I wanted them to really bleed out from the background," says costume designer Kym Barrett, as we black out for a moment. For the 20th anniversary, costume designer Kym Barrett looks back on how the famous wardrobe helps tell a story that feels even more relevant in 2019.